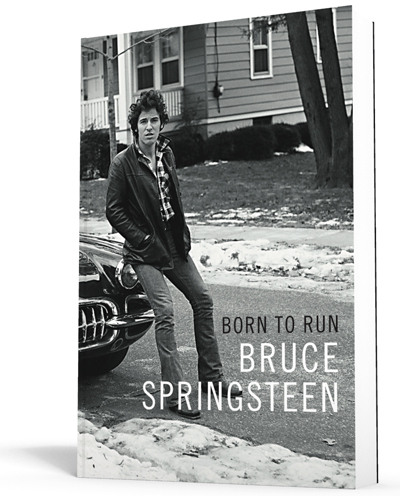 Order now for a FREE bookmark: In addition to the above discount, everyone who orders this softcover edition from us will also receive a Born to Run bookmark (front and back pictured above), a promotional item provided for us by Simon & Schuster. The 2017 paperback edition of Bruce Springsteen's bestselling memoir, originally released in hardcover in 2016. "Both an entertaining account of Springsteen's marathon race to the top and a reminder that the one thing you can't run away from is yourself" (Entertainment Weekly), Born to Run is much more than a legendary rock star's memoir. This book is a "a virtuoso performance, the 508-page equivalent to one of Springsteen and the E Street Band's famous four-hour concerts: Nothing is left onstage, and diehard fans and first-timers alike depart for home sated and yet somehow already aching for more" (NPR). Rolling Stone calls Born to Run "an utterly unique, endlessly exhilarating, last-chance-power-drive of a memoir." Rarely has a performer told his own story with such force and sweep. Like so many of his songs, Bruce Springsteen's autobiography is written with the lyricism of a singular songwriter and the wisdom of a man who has thought deeply about his experiences.